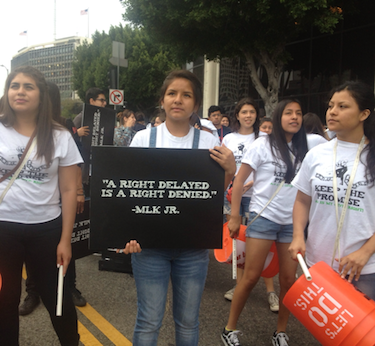 Students calling for better A-G implementation protest outside LAUSD headquarters. It should come as no surprise to any of us that nearly half of the Los Angeles Unified School District’s (LAUSD) high school students are not on track to meet their A-G (required graduation and college prep) courses to graduate, as reported last week by LA School Report. News outlets reported this last year when they covered protests held outside LAUSD headquarters by hundreds of students, parents and education advocacy groups who demanded the renewal of A-G, and the creation of an intervention plan to ensure that students would complete the required coursework with a “C” grade or better, so that they could graduate and, if they so desired, attend a UC or CSU school. The school board responded to their requests by lowering the required passing grade for A-G classes from a “C” to a “D” stating that students needed a diploma to graduate and ignoring the larger issue – accountability for quality instruction. My heart broke as I saw students make the plea to school board members during an LAUSD meeting to raise the standards for them and to believe in them. I had worked alongside students, parents and advocacy groups ten years earlier in the passing of A-G, and here I was again with a new group asking for an incremental adjustment — more A-G classes, quality instruction and accountability. Why our children would have to ask the district to make college prep courses — or quality instruction in each classroom — available to them is beyond comprehension, because this should be an obvious component of their education. One thing is clear, however, and that’s that students have few choices when it comes to getting the education they deserve. When desperate parents seek options out of failing traditional schools through school choice or charter schools, which are more autonomous public schools, opponents immediately cry “corporate” takeover. Equally, when students and their parents raise their voices to demand a high quality education for all, as in the education equality lawsuit, Vergara v. California, their actions too are denounced as being part of a corporate conspiracy to privatize our public education system. It seems as if any effort by parents to seek an equitable education for their children is maligned and aligned with corporate interests. This is an insult to injury. Not only are parents and their children forced to endure a broken education system, but they are also forced to remain in it. How long will our leadership continue to kowtow to a system that holds our children and their future hostage? Just as children and their parents have rightly chanted for the past ten years: “A-G is our right: we have a right to a quality education,” they continue to chant today — unsure of who will champion their cause for education equity. To put the blame solely on the LAUSD for the current skeletal remains of a once robust education system is unfair. We need to go further. We need to look at state policies, legislation and labor agreements that have, over the course of decades, eroded and diminished the rights of children, low-income working families, and ALL families, by claiming the higher moral ground for employees, while much of our leadership remains silent.